Brazilian Bruno Politano leads a field of 146 remaining players in the World Series of Poker Main Event as they headed for a dinner break on Day 5. Brazilian Bruno Politano leads a field of 146 remaining players in the World Series of Poker Main Event as they headed for a dinner break on Day 5 at the Rio Convention Center. Politano was the first player to break the 5 million-chip mark, with 5.27 million. Canadian poker pro Griffin Benger followed with 3.92 million, picking up pocket aces late in the last level before the break to bust another player’s pocket jacks. Mark Newhouse, the only of 2013’s November Nine still fighting for a return to the final table, cracked the top 10 with 3.04 million. Only four women remain in the tournament, with Mikiyo Aoki of Bozeman, Mont., best among them. 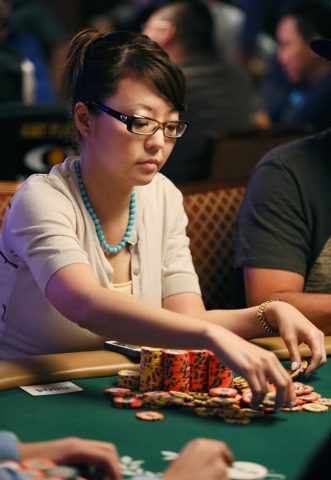 She had 2.28 million chips at the break, while pro Maria Ho held 1.2 million at the break. 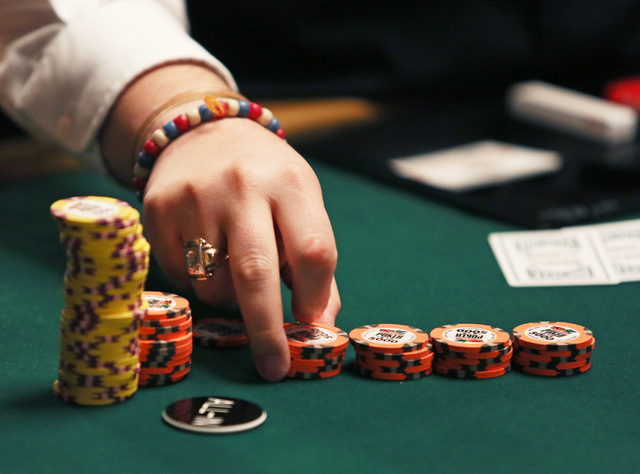 Other notable players still fighting for the $10 million top prize include Las Vegas pro Dan Smith, with 2.85 million in chips; bracelet winner Matthew Waxman, with 2.65 million in chips; bracelet winner Brian Hastings, with 2.56 million chips; and pro Bryan Devonshire, with 1.67,000 in chips. Notable pros Brian Townsend and Rep Porter have been eliminated, along with billionare hedgefund manager David Einhorn, who is donating his $44,728 to charity. Contact reporter David Ferrara at 702-380-1039 or dferrara@reviewjournal.com. Find him on Twitter: @randompoker.